Job seekers are getting more and more frustrated with the lack of jobs or rather, for not landing jobs even after numerous applications. This frustration has led many to give up the job hunt seeing that there is no hope, yet all they have to do is press on and find out where they are going wrong in their search. Linda is one such candidate; she had been making applications after applications but without any luck or invitation to interviews. She applied to companies directly but when nothing came of it, she decided to try out applying through recruitment firms. It was not easy either but she kept pressing until one day she was invited to an interview with Corporate Staffing Services (CSS) for a Finance Manager position in a microfinance company. 1. How did you hear of CSS and the job opportunity? In my job hunting process, I had analyzed all the recruitment firms and registered my CV with them. I had sent my CV on several occasions to Corporate Staffing without securing a single job interview, but I didn’t despair so I continued making applications. I then came across the advert for a Finance Manager position and after applying, was called to an interview which I succeed. 2. How was the application and interview process? It was simple and straight to the poin. 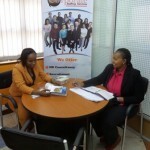 I was invited to their offices at Westlands where i met one of their recruitment manager. 3. What’s your inspiration for Microfinance and how is working there any different from other financial institutions? I think my inspiration comes from way back in years actually. I always wanted to be a banker and I had to find my way back to the industry. I enjoy what I do. About the experience, I would say it is not much different from working with other finance institutions since my former and current employers function under CBK’s regulations like the others. 4. Microfinance is said to be growing, having been in the industry, do you share this opinion? She admits that the microfinance industry is indeed growing, especially with the changing technology that is leading to automation in a number of processes which is in turn accommodating more people who are left out in normal banking. However, Linda is worried that this automation is going to impact negatively on jobs. “Though growing, this might not translate to more jobs as expected” she says. 5. What is your advice to candidates looking to have a successful career in Microfinance? Finance is all about passion, be it in microfinance or other institutions. Go to class and familiarize yourself with all the accounting aspects. Take up junior positions and get the necessary experience, that’s all it takes. Linda did not give up in her job hunt even when it was frustrating, you too can choose not to. There is no doubt that the job application process is tedious and sometimes even imploring does not mean you have to give up and allow frustration to kick in. Reach out to someone you know, attend career fairs (some are free) or talk to career professionals, then implement what you learn. That’s great for Linda, have just completed studies,currently attached at Kenya National Bureau of Statistics, I have sent several application to corporate staffing. I am sure i will be soon called for an interview. But i will keep on pressing in search for job. Keep it up CSS. Thank you.